Four young men from St Charles’ Seminary in Perth will this Friday reach one of the great milestones of their spiritual journey as they step into the diaconate – one of the three forms of the sacrament of Holy Orders. 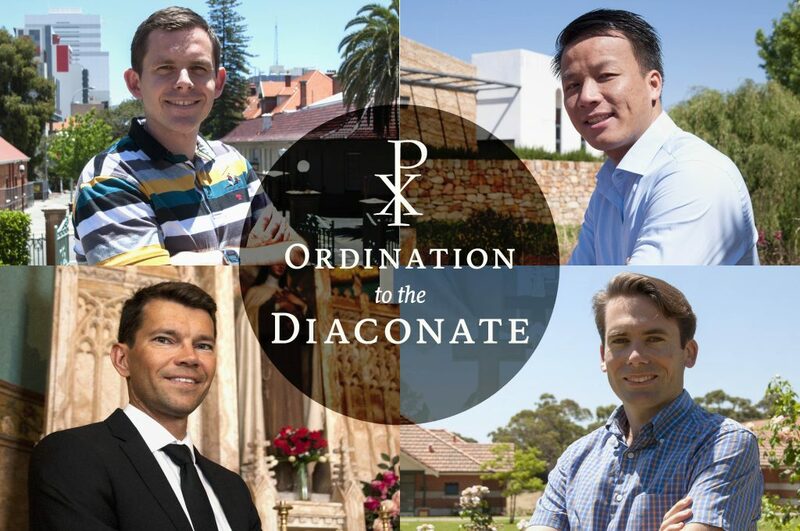 Tung Vu, Joseph Laundy, Mariusz Grzech and Konrad Gagatek will be ordained to the diaconate by Archbishop Timothy Costelloe at St Mary’s Cathedral in a momentous occasion eagerly awaited by the Archdiocese of Perth. Hailing from Vietnam, Poland and Australia, the four men have reached this important step of their formation through years of prayer, discernment, academic study and service within and outside of the Archdiocese. Their ordination brings them a step closer to the ministry of priesthood. For 32 year old Tung Vu, who is currently assisting at St Mary MacKillop Parish in Ballajura, the importance of the role of the family in the spiritual formation of young people is held in very high regard. Born and raised as the youngest of six children in the province of Ha Noi, Vietnam, Mr Vu recalls with fondness the ongoing efforts of his parents to transmit the Catholic faith to him and his siblings from a very young age. Referring to their dedicated approach as “the planting of a seed of faith which gradually grew into a vocation,” Mr Vu decided to join the local St Joseph Minor Seminary of Ha Noi in his late teenage years. In conjunction with his university studies (he studied a degree in Arts and Sciences), he spent four years of spiritual formation in St Joseph’s Seminary before working as a volunteer missionary in the northern diocese of Lang Son for a further three and a half years. “I believe that those initial years in the seminary combined with my time as a missionary confirmed the vocation to the priesthood that had been gradually growing within me,” Mr Vu said. Much like the other seminarians at St Charles’, Mr Vu pursued his academic studies by attending courses of Philosophy and Theology at The University of Notre Dame in Fremantle. He recently graduated from the University and is ready to dedicate himself to the ministry of deacon. “I approach my upcoming ordination with joy and a certain degree of trepidation. I believe that the grace of the sacrament will help me to overcome that fear. Also raised within a Catholic family whose Sunday Church attendance inspired in him a desire to know God in a deeper way, Perth boy Joseph Laundy was raised in the suburb of Floreat with his four brothers and two sisters. Extremely fond of the beach and of coastal life, Mr Laundy grew up ‘on the move’ as he often travelled interstate and internationally with his family. This inherited love for travel eventually led to an 18-month round-the-world trip that included Israel as one of the stop overs. As the trip coincided with his growing desire to join the priesthood, Mr Laundy found walking on the land which Jesus had walked truly inspiring. “The highlight of my trip was walking through the Holy Land and experiencing the holy sites and places of the Bible. It was humbling witness the timelessness of the faith and it was there that I decided to resist no longer God’s subtle but persistent call,” he said. Encouraged by this experience abroad, Mr Laundy applied to join St Charles’ Seminary in 2012. Looking ahead at his ordination, Mr Laundy is confident of his decision to take this significant step towards priesthood. Arriving to Australia from Poland at the age of five, Mariusz Grzech first lived in Sydney before his family settled in Perth where he grew up in the suburbs of North Perth and Leederville. At the beginning of a career in accounting which took him to Sydney, Mr Grzech felt that he was being called to much more than his nine-to-five job and, in late 2008, he moved back to Perth to discern whether he was being called to a religions order or to the diocesan priesthood. He eventually joined St Charles’ Seminary in 2010. “Life as a seminarian has been a time of personal and spiritual growth as well as consolidation of the life experiences which have shaped me as a man, and person trying to live an authentic relationship with Christ. “There have certainly been challenges but also many corresponding graces and what I would call ‘necessary purifications’ throughout my journey. I’ve made some great friendships and have gained many insights through the wisdom and guidance of my mentors, through living in community, and the pastoral experiences gained while on parish placement,” he said. Having attended two World Youth Days, the most recent of which was in his country of origin, Poland, has significantly contributed to the deepening of Mr Grzech’s love for the Catholic Church, its youth and the rich Catholic heritage. As he looks ahead at his upcoming ministry, Mr Grzech feels that no task will be too big as long as he places his trust completely in Jesus Christ. “I consider it quite appropriate that before being ordained to priesthood men spend time in a role which largely entails service and proclaiming the Word of God. These are two aspects which in themselves are formative and I’m looking forward to learning and growing closer to Christ through serving His people. Also a migrant from Poland, Konrad Gagatek arrived to Australia in 1991 with his parents and older brother and grew up in the Perth suburb of Maylands. Among the fondest memories of his upbringing and schooling is that of time spent with Principal of Divine Mercy College, Adam Zydek – a man who greatly inspired Mr Gagatek and who contributed to his desire to become a priest from an early age. This growing call to the priesthood followed Mr Gagatek to Sacred Heart College in Sorrento, where he undertook a final year of high school before completing a bachelor’s degree at Edith Cowan University and finding employment for two years. “After completing my studies and working in Perth city, the persistent stirring in my heart which developed in high school wouldn’t leave me. I couldn’t help but feel that God was calling me to serve His Church as a Priest. I applied for admission into St Charles Seminary in 2011 and a few months later received an acceptance letter from Emeritus Archbishop Barry Hickey,” Mr Gagatek said. Dwelling on his formation at the seminary, Mr Gagatek describes his time at St Charles’ as one of thoughtfulness, prayerfulness, team work and academic excellence in which he saw himself being formed as a priest while constantly discerning whether this was God’s will for his life. Without these years of deep contemplation, he says, he would never have reached the threshold of the diaconate before which he currently stands. The Ordination to the Diaconate of Tung Vu, Joseph Laundy, Mariusz Grzech and Konrad Gagatek will take place on Friday, 2 December 2016 at St Mary’s Cathedral, Perth, 7:30pm. For those unable to attend, the ordination will be streamed LIVE via social media from approximately 7.15pm, to watch please go to www.facebook.com/TheRecordPerth.